Wintry weather has continued to cause travel disruption in parts of England. Several roads and dozens of schools were closed as snow and ice caused disruption for a second day. Manchester Airport said 36 flights had been cancelled after snow forced the suspension of services on Thursday, which caused a backlog. In Scotland, further snow is expected later in the day and across the weekend, which could cause further travel disruption. 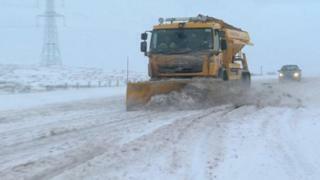 Overnight, 30 abandoned vehicles on the Woodhead Pass, near Sheffield, were moved following heavy snowfall. In the south-west of England, ferry sailings from Plymouth to Roscoff have been cancelled until Sunday, due to the weather. In Cumbria, a number of major roads remain closed by snow and a HGV got stranded on one of the UK's highest roads - on the Kirkstone Pass - after ignoring closure signs in place because of severe weather. More than 60 schools in Staffordshire have been closed and heavy snowfall caused significant disruption in the Moorlands area. At least 60 schools have been closed in Derbyshire, more than 40 in Cumbria, about 30 in East Lancashire, about 20 in Leicestershire and Rutland and at least 20 in Oldham, Greater Manchester. Overnight, snow and ice resulted in the diversion of at least one flight to East Midlands Airport. Some train services have been suspended, including the line between Liverpool South Parkway and Hunts Cross, which is blocked due to frozen snow. Earlier in Essex, a slip road on the M11 was closed due to "adverse weather" after reports some vehicles struggled to travel up the slope. Alternatively, for regular travel bulletins listen live to BBC Radio Stoke, BBC Radio Derby and BBC Radio Cumbria. Has your journey been affected by the snow and icy conditions? You can email haveyoursay@bbc.co.uk with any information. Please leave a telephone number if you are willing to be contacted by a BBC journalist. You can send your pictures and videos to yourpics@bbc.co.uk or text them to 61124 (UK). Or you can upload here.